Ernest De La Torre, founder of De La Torre Design Studio, and His Work. Thanks for inviting me to your office Ernie. You just returned from a client meeting at 740 Park Avenue. Can you tell me about that project? Glad to have you here Susan. This is a unique project because I began working with this client in ’05 on just the Living Room and freshening up some others. Then we worked upstairs and now on the Dining Room which works due to the building only having Summer Only rules for work. Although these projects have been single large rooms, the level of detail has been more involved than some whole apartment projects. A better example of a typical project would be the job I just finished at 515 Park Ave which I started in fall of ’13 and finished last fall. We were joining 2 floors together, had to put in a staircase and worked with a team of architects on structural and electrical modifications. This client has a love of texture and detail so no surface went untouched; for example the Living room walls are not only finished in a specialty seven layer waxed plaster, but they also have curved gesso panels incised in Paris and bronze stringing throughout. Art deco is your specialty. Where did you start your training? I earned my Masters in Fine and Decorative Art in London and my concentration was French Art Deco. So sometimes we look at the great masters of French Art Deco for the concept and structure, but bring it into the 21st century with pieces by celebrated new artists from Paris, Germany and Spain. Their work continues the tradition of the old masters in the 20’s by hand crafting each work using precious interesting materials. What kind of materials? I’m curious. For instance, I work with Herve van der Straeten, the French ebeniste who will combine wrapped parchment, sycamore wood and hand carved bronze with such perfection and artistic flair you know they are instant classics. My clients are sophisticated and understand the value in this type of work. Of course there’s an involved selection process by and with the client in tune with each client’s personality and needs. As you saw from the Press here in the office I don’t have a ‘standard signature look’. There are definitely artist I favor, but I try to push them to make different things to fit clients uniquely; that said I have had people say “I can see your hand at work here”. Client desires can vary as much as do their personalities- –some of my clients like an eclectic mix, where they have pieces from the 1800’s all the way through 2016 and they want them to work together and play nice, mix with their art collections which I often curate. Then there are other people who want to stay within a period, or have a more calm, linear design, and I can work with that. As long as we agree that it needs to be unique, special and tailored to them, we work well together. It was interesting, as I learned that you initially worked with Peter Marino, Ian Schrager and then with Ralph Lauren. Actually, TOWN has a working relationship with RLH where we introduce our clients to their design staff and RLH provides free design services as well as a significant discount. When we were introduced to their newest collections last fall I was struck by the wide variety of looks and styles but the scale was still what I recall as cumbersome and despite the style there was nothing at all on the dainty side. And when I looked at the furniture and accessories that you design I thought “Ernie doesn’t bring that feeling to his work at all. Of course, now that I better understand your training and preferences it makes total sense. Yes, and part of the reason that I was brought into Ralph Lauren was as a Creative Consultant to develop lines of furniture and accessories that work within the vocabulary of Ralph from my experience with Peter Marino that appealed to interior designers. 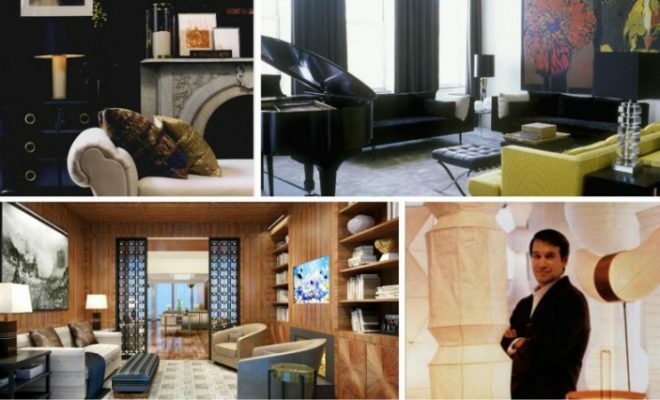 The head of Home, the mutli-talented Alfredo Paredes recognized a need to serve the interior design community as well as the retail customer; part of that included making items scaled to city living and not just large home. Now you’ll find in the RL furniture line that there’s a standard-sized piece as well as a city-scaled version which I have used in some projects. Yes, I’m not fond of that over-stuffed, over-sized look. I think it can be large and sleek at the same time. At one time I adored art deco, in fact our loft in Soho had mauve carpeting, a curved frosted glass wall, it was almost a caricature of deco. I just recently sold a black lacquered dining table I’d had for years with a chrome, triple banded base. No matter how much I like an eclectic mix I just couldn’t look at it anymore. I tend to stay clear of art deco furniture that I call too ‘Radio City’ or stylized. I did an entire apartment for a client who allowed me some latitude as it was their pied-a-terre. When he came to the apartment and I explained the influences of the French Art Deco masters in certain pieces, he was surprised and said he thought it was all just clean modern. I said “perfect- then I have succeeded!”. Translating great influences from the past into a fresh interior ready for today’s living is always one of my goals. Most of it is made in Brooklyn and Queens – we still have some of the best craftsmen in the world there, and more coming from France and Eastern Europe all the time. I make a great deal of cabinetry in Paris but it’s important to make sofas and chairs locally, so my clients can sit in the pieces. I had one gentleman early on who was 6’4” who couldn’t get comfortable in a chair so after he tested a few he was amazed by how comfortable the chair we produced was. It’s like custom clothing- makes all the difference in the world. What brought you to London Terrace Towers? I had been living in an apartment in a gorgeous townhouse on the Seminary Block when we bought in Sneden’s Landing and decided to commute the 15 miles into the city. The daily commute got old fast and London Terrace made sense for its proximity to my work studio. It appealed to me as a classic prewar coop, with limestone details and something the townhouse didn’t have-a doorman and elevator! And why did you select a studio? Kris and I thought, we always travel and enjoy some gorgeous hotel rooms so why not create a fabulous hotel room? I wanted a 5 Star hotel feel when I created the bathroom for instance. The London Terrace studios are so large they allow for a spacious walk in closet, luxurious bathroom, and sunny main room to live in. Yes, I looked at some of the photos of the apartment and wondered how you got a double sink in the bathroom! I pushed the room out and used the space where the refrigerator would be and created the huge stall shower which was not so easy, but was worth the work. We’re always out at Soho House for dinner with friends, never cooking here, so I have a perfect warming station for take out. I had a custom sycamore kitchen in storage from a client for too many years and worked with that. I noticed a fancy little hotplate on the counter. No stove? No need for one, as I said. In fact, I only have the hotplate because a friend was staying there for a while and insisted that he had to make his coffee in the morning. I said, why, when you have Joe’s right downstairs and can go across the street for eggs that will be made so fast you can’t even get to Page Six. Yes, certainly in the time that I’ve lived in London Terrace the neighborhood has grown and changed around us. When I arrived the only good restaurant was Empire Szechuan. Now it’s flanked by two great tepas places, Sullivan Street bakery and Co. for some of the best pizza in town. And that’s within 1000’! What I like about West Chelsea too is that it’s a real neighborhood. I see the same people at the dry cleaners, Joe’s and on the sidewalk. I’m very happy here, though we do enjoy knowing that we have a spacious house to escape to, especially now with a 3 month old. My guess is that it’ll be a while before Parker will be spending much time here. That or I will likely be looking for a larger place before long.